SCHOOLCHILDREN are to have their poetry inscribed on benches in Whitehaven. As part of the Whitehaven Townscape Heritage Initiative, trees, a wall, an information board and the benches are being installed at the plaza on the corner of James Street and Irish Street. GCSE English pupils from St Benedict's recently worked with poet Emma McGordon to create a piece which will be engraved on the backs of the new benches. Whitehaven THI officer Jane Taylor discussed with the pupils the history of the Old Town area of Whitehaven. They heard: *how Pow Beck, which now runs underneath the plaza, used to run openly down what is now James Street and the Market Place, *how horses pulled iron ore wagons along rails to the harbour *about the many industries that were located on the site where Albion Square now stands. Emma worked with the pupils to produce their ideas, then took them away to incorporate into her poem. Emma McGordon added: “The students at St Benedict’s were genuinely interested in creating something lasting and I’ve incorporated their ideas into the final piece.” Copeland's heirtage Champion, Coun Michael McVeigh, said: "The whole of the THI has been fantastic for this part of town and this is just the next step. The changes will be very attractive and the fact that local childrwen have been involved in creating something evocative and lasting is wonderful." from the clop of horses to the clip of heels. now stands steel beneath a new, clear sky. of memory; the sons who became fathers, the daughters who bore. and all those who walked, walk and one day will be walking. 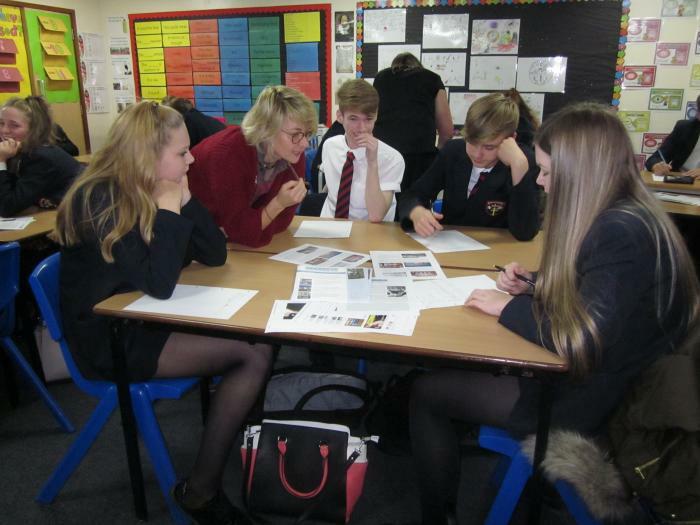 Caption: Emma McGordon joins St Benedict's pupils to create a poem.